The 12 gauge is by far the most popular shot shell caliber in the world, holding approximately 50% of the market, leaving all other gauges to make up the other half. It is extremely common, very easy to find ammunition just about anywhere, and is tremendously versatile. The drawback, known to practically all shooters, is a punishing recoil. Buck shot, particularly the ever-popular #00, is a mainstay of most shotgun owners. You can shoot it out of any barrel and any choke (unlike slugs) which gives any shotgun the ability to be a devastating self-defense weapon as well as viable for medium game hunting in states which have shotgun seasons. But this takes us back to the problem at hand: magnum loads, which almost all buckshot are, hurt. There is no way around it, and there is no shame in admitting it. Magnum shot shell loads are brutal. What’s more is that they are way overkill on all things smaller than bears, moose, etc., and they are particularly overkill for predators of the biped variety. Enter the Winchester Ranger Low Recoil in 00 buckshot. Still plenty powerful it sends nine 00 pellets downrange at 1,145 ft/s and provides much faster follow-up shot acquisition than its magnum cousins. It is manufactured using low flash powder which helps reduce night vision loss. 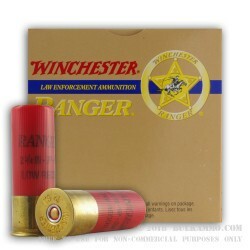 Winchester Ranger Low Recoil 00 buckshot is a great choice for a lot of different applications. If you are in the market for a good defensive cartridge for your shotgun and wish to get away from loads that bruise your collar bone, give this a look. Act fast while prices are low and grab it up now!